Aside from flooding, death from lightning is the highest storm related fatality. It normally occurs in the summer months during times of athletic and outdoor activity. Most often occurs to individuals who are alone, rather than in a large group. The greatest form of preparation is becoming educated and aware of unsafe surroundings. People must be cognizant of the risks of lightning producing storms and the appropriate steps to reduce the risk of lightning related injury. Studies have shown that people suffering from lightening injuries were only a few feet away from safety, but chose to not leave their unsafe environment. 15-30% of the deaths from lightning occur during recreational activities and sporting events. Lightning producing storms are more likely to occur from early spring to fall, with a higher frequency in the southeast part of the United States. How can lightning strikes be prevented? “If thunder roars – GO INDOORS!” Everyone should be in safe zones BEFORE lightning reaches the playing field. If a storm is suspected or lightning/thunder is observed all outdoor activities should be suspended and athletes/spectators should head to “lightning safe” facilities until the weather clears. A “lightning safe” facility is a fully enclosed building with both plumbing and wiring. If a fully enclosed building is not available, people should go inside a car or bus with the windows fully closed and doors shut. Educate athletes, parents, coaches, referees, etc. about the dangers of lightning producing storms and the appropriate actions to take in the event of a storm. Establish several methods for alerting spectators of an incoming storm including a speaker system, text messages, staff announcements, etc and give pre-event warnings, make patrons aware of visual signs to safe zones, etc. When do you suspend/resume play during a storm? A proactive approach can also be taken using the local weather service and listening to warnings. If a warning is given by a weather service it is recommended to suspend activity even if lightning/thunder has not been observed at the playing field. Play may resume 30 minutes after the last sound of thunder/observable flash of lightning. The 30-minute clock restartsEVERY TIME A NEW LIGHTNING FLASH OR THUNDER SOUND IS HEARD. Table 1. Signs and symptoms of a lightning victim. Adapted from: Walsh K, Cooper MA. Lightning. In: Casa DJ, ed. Preventing Sudden Death in Sport and Physical Activity. Sudbury, MA: Jones & Bartlett Learning. 2012: 332. How do you treat a lightning strike victim? Make sure the scene is safe to treat the lightning victims. You should not place yourself in harm if danger is imminent. Be prepared to treat people in cardiac arrest, have severe burns, shock, fractures another trauma. When can a lightning strike victim return to activity? Once the individual has been treated and followed up and cleared by appropriate medical personnel, the athlete may begin a gradual return to activity protocol. The timeline for return to play is dependent upon the severity of the lightning strike and the inflicting injuries. The table below describes some possible neurological damage that may occur with a lightning strike victim. What equipment do you need to be prepared for a possible lightning strike? National Weather Service. 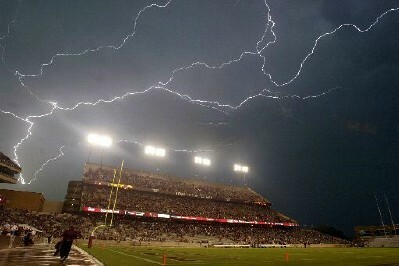 Lightning Safety: Large Venues. Accessed on May 24, 2012. Thomson EM, Howard TM. Lightning injuries in sports and recreation. Curr Sports Med Rep. 2013;12(2):120-124. Walsh K, Cooper MA. Lightning. In: Casa DJ, ed. Preventing Sudden Death in Sport and Physical Activity. Sudbury, MA: Jones & Bartlett Learning. 2012: 157-168.